Blockchain and payments will thrive in 2016, which is expected to be an otherwise tough year for unicorns, say Magister Advisors. UK-based Magister Advisors advises the technology industry on mergers and acquisitions. Its report, entitled “The Tech Industry in 2016: the $0.5 Trillion Unicorn Test”, argues that technology startups are in for a harsh dose of reality in 2016. 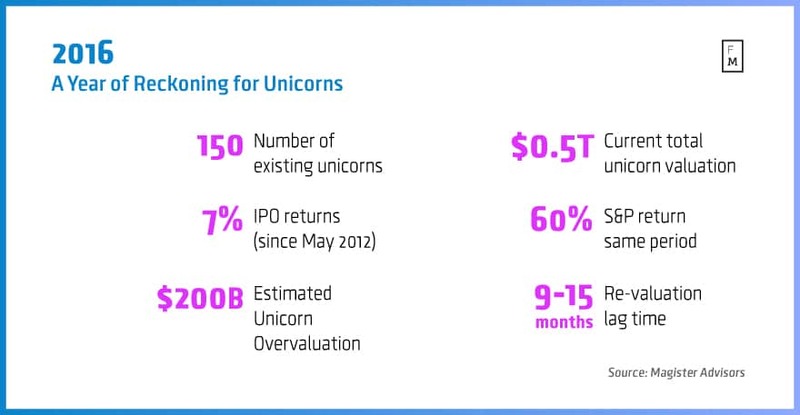 The term “unicorn” refers to startups reaching a $1 billion valuation while still privately held, which not long ago was such a rarity that they were likened to the legendary beast. According to the Magister report, there are now 150 unicorns. The report argues that tech startups have been grossly overvalued, particularly during “2015’s extremism”. It points to reduced valuations of Snapchat and the re-pricing of Square’s IPO as examples of more re-evaluations to come. “At least one Unicorn will go to the glue factory in 2016 and the weakest businesses will see mass lay-offs as funding evaporates,” the report asserts. A unicorn (or two) will blow up in 2016, just like Fab.com went from a $1 billion valuation to a $15 million fire sale within 12 months. The report stipulates that today’s tech startups are generally of a high quality, just that valuation expectations have been unrealistic. It goes on to paint a brighter picture for the blockchain, which is envisioned to transform the way financial institutions settle securities trades and payments, as well as for other applications demanding immutable ledgers of record. “Within FinTech, payments and Blockchain will be the most active segments – 2015 saw large financial institutions accelerate their pursuit of blockchain initiatives, and we will enter 2016 in a ‘race to production’ with vendors and FIs alike, vying to see who can be first to reap the benefits in actual deployment,” says the report. Magister issued another relevant report about a month ago. A survey of leading crypto industry companies made the bold prediction that bitcoin will become the world’s 6th largest reserve currency by 2030. The report was also particularly upbeat about the blockchain, which it claimed to be the most significant advancement in enterprise IT during the past decade. It further argued that the top 100 financial institutions will spend $1 billion on blockchain projects during the next 24 months. One may argue that cracks have already appeared in the crypto sphere, at least when it comes to bitcoin as a currency/asset. Venture funding has slowed considerably in the second half of this year. BitPay, a household name for bitcoin integration with merchants, cut back a portion of its workforce. Bitcoin wallet and merchant services provider Coinbase was envisioned by some to become the crypto industry’s first unicorn. It has secured $106.7 million in funding to date, the second highest in the industry. However, one may question if its revenue model is strong enough to warrant such a valuation. Coinbase’s total revenues from its bitcoin brokerage and merchant services are miniscule. Coinbase’s exchange, launched earlier this year, may be a better source of revenue. It is currently supporting volumes of about 250,000 BTC per month. Assuming an average bitcoin price of $350 and a 0.25% commission for market takers, this translates into annual revenues of roughly $2.6 million, which does not warrant a $1 billion valuation. The revenue models for several other crypto startups, including big names like Xapo and Circle, can also be called into question, and the coming year or two may be game changers.